I'm quite convinced this photograph of Robert Duncan touches on something central to the man and his poetics. Two things, actually. 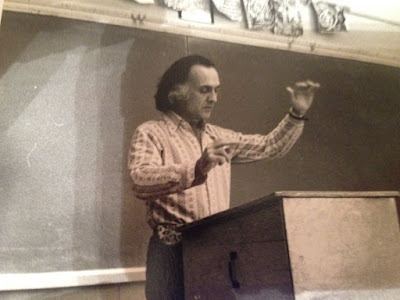 When Michael Anania showed me the photo, taken by David Lenfest when Duncan was reading to Anania’s students at the University of Illinois—Chicago, he described the movements of Duncan’s arms, which made Duncan appear almost as if he were in flight. “One hand played the rhythmic beat,” said Anania, “the other kept the longer cadence.” And here, already, is the first fact of interest: the fact that Duncan was not only a strongly rhythmic poet, but that he thought of his poems in polyrhythmic terms, so much so that he enacted those rhythms for his audiences. Duncan, too, was uneasy with the academic institution as a venue for poetry—and, indeed, with the much broader cultural and historical movement of which the university is but one minor emanation. He was uneasy with—no, that doesn’t go far enough—he waged war against modernity itself, inasmuch as modernity can be defined as the triumph of the rational over the irrational, the positivist over the mystical, and the disenchanted over the magical. The university lecture hall hardly seems a fitting place the broad, dramatic gestures caught in Lenfest’s photograph of Duncan. Don’t they belong elsewhere? Perhaps in a sacred grove, a temple, or a catacomb where the members of a sect have gathered for their rites. Duncan’s mysticism and irrationalism are, of course, in his blood: his adoptive parents were Theosophists, believers in the occult, who selected him as their child based on astrological projections. He was raised with a deep respect for the mystical, and we find this background very much alive in his conception of the poet as magus, as the sorcerer-priest of a heterodox spiritual tradition. "There is a natural mystery in poetry," wrote Duncan in one of his notebooks, "a poem, mine or another's, is an occult document." Metaphors matter: any reader of poetry knows that. And Duncan's metaphor is a far cry from, say, William Carlos Williams' when he writes that a poem is a machine made out of words. Come to think of it, though, Duncan doesn't intend this notion of the occult document as a metaphor. He means it, earnestly, seriously, literally. Duncan’s war with modernity was deadly serious, a matter of passion, even rage. In one of the many documents collected as The H.D. Book, Duncan tells us of his own incipient attachment to poetry, first to the Romantic poets and then to the tradition of the troubadours. “There has been a fire,” he writes, “ a fire of anger that rose, as I found the Romantic spirit and back of that the Spirit of Romance and back of that the cult of life as a romance of the spirit belonged to an order that was under attack or under boycott.” The world of scientism and rational disenchantment—the world of modernity—was for Duncan what it was for William Blake: an iron age, a cage confining us, a set of mind-forged manacles. Poetry was a counter-attack upon our enemies, a tunnel dug beneath the walls of reason in which our wardens confined us, a weapon in the only war that mattered. For men who declare themselves partisans of the rational mind at war with all other possibilities of being, the pre-rational or the irrational appears as an enemy within…. In the extreme of the rationalist presumption, the nursery is not the nursery of an eternal child but of a grown-up, a rational man. Common sense and good sense exist in an armed citadel surrounded by the threatening country-side of phantasy, childishness, madness, irrationality, irresponsibility... In that city where Reason has preserved itself by retreating from the totality of the self, infants must play not with things of the imagination nor entertain the lies of the poets but play house, government, business, philosophy or war. The theory is grand, even grandiose—imagination, irrationalism, and innocence putted against reason, materialism, and war—and the poetry that is both explained and fuelled by the theory is some of the most powerful in the American poetic canon. But the actual manifestations of this great historical struggle in the events of Duncan’s life are, as one might expect, rather less Titanic in scale. 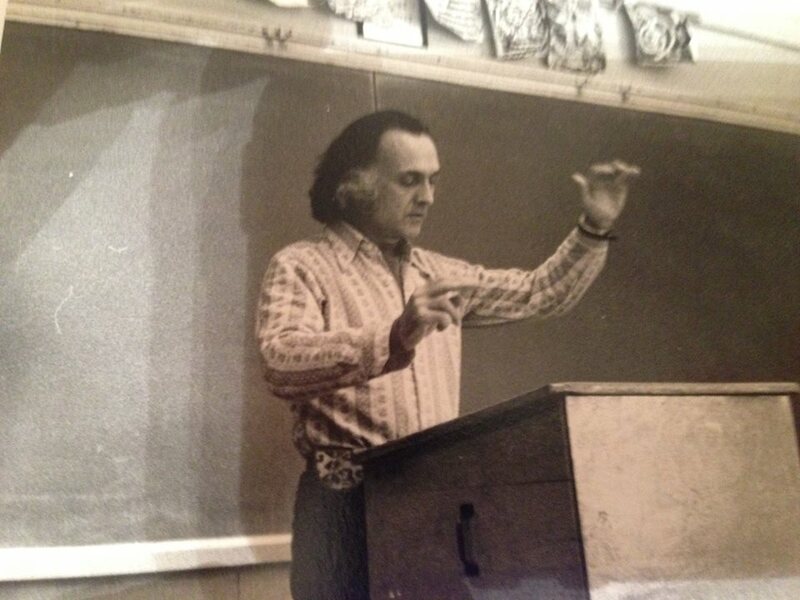 One thinks of an event in front of another blackboard, in 1978. It was at a gathering to celebrate the poetry of Louis Zukofsky. Duncan spoke first, and, by all accounts, manifested very much as the poet-magus, in a broad-brimmed Spanish hat and cape, praising the mystical side of Zukofsky and looking, as David Bromige recollected, like he was there to “ward off evil magic.” Then another speaker took the stage—Barrett Watten, then just 30 years of age, looking every inch the junior professor in his sport coat, khakis, and buck shoes. He began by drawing a diagram of a Zukofsky stanza on the blackboard, and proceeded with a clear, rational analysis, to which Duncan took immediate, vocal exception. He heckled, he cajoled, and ultimately he pushed Watten from the stage. The moment was many things: an older poet worried about the Oedipal drama of rebellion, and a generational conflict, Black Mountain vs. Language Poetry, among other things. But it was also, and definitively, a moment in which the magus of the irrational turned against the Apollonian representative of reason. The breach of decorum and the incivility are entirely explicable, if not necessarily excusable. Here, at a celebration of poetry from beyond the mainstream—in what to Duncan’s mind must be a center of resistance to modern rationality—was a representative of our enemy, rationality. Indeed, from where Duncan stood, the breach of etiquette was all Watten’s, and “breach of etiquette” hardly touches the seriousness of the offense. Poetry, charted, mapped, and analyzed theoretically? We murder to dissect! It was heresy, blasphemy, a desecration of the temple. The great and domineering enemy has found us in our catacombs, and must be cast out! Greer Mansfield once observed that for Duncan, the study of poetry was a version of a lost, primitive religion—how could he react to the young Watten with anything but a sense of outrage? And how could his gestures when reading in a university, in front of a blackboard and behind a lectern, be anything but incongruous? The incongruity, though, is its own explanation. Duncan’s mysticism, like that of his Theosophical parents, is very much a product of modernity—the modern theosophical movement, which draws on many ancient traditions, was founded in New York in 1875. Duncan’s beliefs—his poetics and his mysticism—are fundamentally reactive, attempts to correct a culture gone too far in the direction of positivism, materialism, utilitarianism. So when we see Duncan in a gesture like that in which Lenfest’s camera caught him, against a background so out of keeping with the grand drama of the physical movement, the jarring juxtaposition is in fact quite revealing. It shows not only Duncan’s sense of himself as magus, but the rationalized, institutionalized social environment that gave birth to that sense. The photo, then, is an apt emblem of Duncan as a counter-cultural figure, a man in rebellion against his world. And where else would we encounter a mystical poet of Duncan’s time but in a university, the modern institution that is so frequently, but with such fragility, the site of modernity’s self-critique—as well as modernity's preservation, and perhaps co-optation, of its others?